Updated the site with Game Over. Thanks to everyone who played! Added the The Parting of Ways recent event. Added the Hakon's War recent event. Note: Due to server issues, checkout and BGAs will remain open for the November event until after the Jan 9 one-day. Fixed some issues with the New Player Form. Added Dragon's Shadow to Mystery Cults page. Added the Siege of the Hulder recent event. Added the Bloody Fields of Bazmel recent event. Added the Verdict in the Trial of Rahala Sevast recent event. Added a brief description of the Re-Invasion of the Athral Isle, AKA, Hakon's War. Added a New Player Form to the forms, events, and new player pages, to hopefully make character submissions a little easier! Added Death Tracking to the Checkout Form. Added July events to the events page; prices and ability to pre-reg coming soon. Added May Feast to the events page. Added the Summer Palace ancient tale. Added Fallen to the Bestiary Page. Added LARPcore.com to the links page. Check out our sweet listing! Corrected a reference from Light Stun to Light Knockdown in the Swordbane ability. Removed references to Stun in the Glacierborn ability. Added a paragraph on Investiture spells, and spell descriptions for the Investiture of the Jewel of Expression, Investiture of the Jewel of Refinement, Investiture of the Jewel of Clarity, and Investiture of the Jewel of Healing. Corrected a reference to Dust Haste in Ebon Aspect. Added a line clarifying that Hammering Frost is a specific exception to the change to Exalt Weapon effects not working on missile weapons. Corrected a reference to Crippling Strike; DtD uses Crippling Blow. Added the rules details of the Redwood Throne and Heart of Shadows (Left Hand of the Throne) totems. These are now available to starting characters. Flavor text for these totems will be available in a future patch, but much of the salient detail is available on the website already. Changed Sweep the Leg to Dirty Pool. Dirty Pool is a 1/combat Spellstrike Dust Mental Befuddle. Removed the paragraph about pouches from Container rules. For practical game uses, pouches are costuming rather than containers. Removed a reference to Fire in the Engulf effect. Added a note to Bless Weapon and Exalt Weapon that, unless an effect specifically states otherwise (as with Hammering Frost), these effects cannot target a missile weapon of any kind. Updated all forms for the current confirmed games of 2015. Updated home page, et al, for next event; general maintenance. Updated Redwood Throne page to reflect current political situation, and revised core tenets. Added brief historical note on the Sack of Khaldun to the Recent History page. More information to follow. Added the harassment policy to the Policies page. Made long, long overdue updates to the Staff page. Changes to the Event Page; Added dates & locations to the Jan and Feb One Days; added the March Three Day. The remainder of 2015 events will be posted pending announcements in future. Changes to the Event Page; Jan and Feb One days added. The remainder of 2015 events will be posted pending announcements in future. Added The Matriarch and the Anti-Matriarch: Civil War in the Principalities. Added Ghul Siege of Khaldun. Added several brief historical notes to the Recent History Page. Changes to the Event Page; December 3-day event removed. 2015 dates to come shortly. Added Martin Thatcher (Jeremy Thomas) to Assassination of Princess Abelone. Home page event dates are now updated; misc bug fixes. Added Ordo Virtutum to the Codex of Dust. Added June feast menu to the events page. Livia’s Curse is now a Spellstrike Aether Pain, 1/day. Any rituals referencing Storm Stun are now Storm Knockdown. Changed the Knockdown combat maneuver text to reflect the change to the effect, listed below. Changed Call of Thunder from Storm Knockdown to Storm Mental Decree: Flee. Changed Lightning Strike from Storm Stun to Storm Knockdown. Changed Rime of Preservation to trigger when the target’s bleedout count reaches 1:59, rather than immediately upon beginning to bleed to death. As a result of in-play events, the Ebon Aspect totem has undergone significant changes in its 4th, 6th, and 10th mysteries. Changed Decay from Dust Stun to Dust Knockdown. Changed the reference to Stun in Earthen Form to Knockdown. Changed Heaving Ground from Earth Stun to Earth Knockdown. Changed Sky’s Judgment from Storm Stun to Storm Knockdown. Removed the reference to Daze in Sturdy. Changed Oppressive Blow from Daze to Spellstrike Flesh Trance. Changed Rend and Tear from Mental Pain to Spellstrike Flesh Pain. Changed Fancy Footwork from resisting Knockdown and Daze to Knockdown and Slow. Changed Pummel from Spellstrike Earth Daze to Spellstrike Earth Trance, and Spellstrike Earth Stun to Spellstrike Earth Knockdown. Changed Smash from Earth Stun to Earth Knockdown. Changed Stone Presence from Earth Stun to Earth Knockdown. Changed Stun in Watch This to Knockdown. Removed the reference to Stun in Knowledge of Historical Artifacts. Changed Stony Sinew from Daze to Spellstrike Earth Weaken. Removed Daze and Stun from the effect list. Knockdown now causes the target to be knocked onto their back a lay insensate for ten (10) seconds. Alternately, the player may kneel and place both hands on the ground. While knocked down, a character may perform no actions other than to ward off a Killing Blow. This effect bypasses armor, skins and toughness. As before, this effect lasts for 10 seconds. Updated events page with feast choices for the April 5-7 game. Added Assassination of the Patriarch to recent events. Updated games page with Baduk (Go), a game popular in ancient Mazhan, and Silence, from the Celestial Manse. Incidentally, anyone who wants to provide a write-up of Liar's Dice is encouraged to do so! Added a brief description of the Assassination of the Patriarch to recent events. More information about this event coming soon; reports at this time remain conflicted and confusing. Added Farad al Sahin (Mike Haffey) to The Battle of Nezihe's River and The Battle of Sultan's Road recent events. All PC roles for the Battle of Sultan's Road are now filled. Added rules for the Advanced Chirurgery talent. This talent requires teaching from a PC or NPC who already possesses the talent, or individual research. Block Arrows enchantment changed to work 3 times per combat on small shields and 2 times per combat on large shields. It still works an unlimited number of times per combat on bucklers and armored fists. Characters currently possessing a shield with the Block Arrows enchantment may opt to trade that enchantment with any other basic shield enchantment listed in the rulebook. The replacement enchantment has a duration equal to the remaining duration on the Block Arrows enchantment. Triggered Disarm increased to 2/day. Corrected the effect of Animal Empathy on Desert Screamers. Removed a reference in the Stabilize effect that said a Stabilized character never became Walking Wounded. A Stabilized character who receives no other healing becomes Walking Wounded in one hour. Moved “Pin Foot” to its correct place in alphabetical order. Updated Bestiary with information about sea trolls, watery dead, other kinds of were creatures, wickermen and nimori. Added a News Post covering changes and events taking place during the winter downtime between the November '13 event and the Feb '14 One-Day. Updated events pages with event info for the rest of the year. Pre-reg buttons to come soon! Added games page with the Barrows, a new "stones-and-bones" style board game. Updated checkout page and FAQ to reflect new blanket, and remove cap out with buttons & xp nomination fields/information. All other forms updated as well with new dates. Added information to BGA form and FAQ to indicate that creating a ritual focus and learning a celestial spell are in addition to the two basic BGAs, and one purchased with buttons. Also updated value of craft BGAs to 10 dinars/towers per level. Updated New Character Creation page with correct build math, finally. Updated home and events pages with checkout info and pre-reg buttons for 2014 events. More events coming soon! Corrected the starting build totals for starting characters in the text and in the chart. Removed references to bleedout in Pain Resistance and Pain Intolerance. These Advantages have no effect at all on the time or causes of bleeding to death. Added a note that some Lore skills may not be taught directly. Craft skills now pay out ten silver towers or dinars per level. Added the recent Trick Shot clarification to the text of the Combat Maneuver. Added a note that spells heal either Toughness or Wounds, not both. Updated references to PP in BGA usage. Changed the duration of Shadow Form to “Duration of Pose/1 hour” rather than Concentration. Changed the duration of Aether Form to “Duration of Pose/1 hour” rather than Concentration. Clarified the function of Child of Blood to grant a Totemic Resurrection effect that does not require a bone draw. Corrected a reference to the purchase of BGAs in the off-season. Added Nether to the list of Descriptors. Added a note to the Resist declaration that a character must be conscious to use a Resist. Added Wardens of Marath Suvla to Monastic Orders of the Redwood Throne. Added The Sack of Kelkheim to recent events. Added Kian Paidrag (Michael Rollins) to Oakfast at Tanalassa recent event. If you claimed a role, but it has not been updated for you, please send an email to plot (dtd at ruleof3 dot net) so that I can take care of that as soon as possible. Also, please keep in mind, that while we'll respect requests for character anonymity in events, other PCs who took part in that event can probably expect to know who you are, unless the event specifically makes that unlikely. Thanks! Added early 2014 dates to the events page. More events to come as they're confirmed. Added The Smiths, in Ashes and a brief description of the Sack of Kelkheim to recent events. More information about the Sack of Kelkheim coming soon. Added Caracal to Kazlaj's Fall and The Battle of Sultan's Road recent events. the role of the Yeoman in the Taking of the Helga's Curse recent event has been claimed. Added Aggie-Daggie (Ack-o-Lumpy) to Ancient Tales. Fixed a few nav bugs & typos. Updated events page to reflect current confirmed events. Added a clause to Diminished Healing such that a second healing effect of the same type cast within one minute negates the diminishment. Edited the Chirurgery Talent to allow it to reattach severed limbs. Corrected a typo regarding Missile Dodge prereqs. Revised the Eternal Grip master ability of the Lost Blades of Mazhan. Instead of granting immunity, it now grants resists, and beyond those resists, the Lost Blade may reduce the effect to a single wound to the arm. Revised the Radiant Visage master ability of the Vanguard of Oriset. Instead of granting immunity, it now grants resists, and beyond those resists, the Vanguard may spend mana or reduce the effect to a single wound to the left arm. Clarified the interaction of handedness in wounding blows as applied to hand-and-a-half weapons. Edited the healing rules to handle severing and reattaching limbs. Clarified the rules on moving people that are stable but not Walking Wounded yet. Edited the Heal Grievous Wounds and Heal Mortal Wounds effects to handle reattaching and regrowing limbs. Added limb-severing rules to the Pin Foot effect. Clarified that Renew or Greater Renew do not restore Warrior Order abilities or Ancient Arts unless specified otherwise. Added The Death of Lady Nimic and Oakfast at Tanalassa recent events. Added The Master Thief to Ancient Tales. Hopefully fixed the links on the ebook page. Added placeholder Petra's Hearth page. Added The Council of Fridlevur recent event. Updated August one-day information, and menu for June Feast on events page. Added two new songs by the Celestial Elaine to music page of the Codex. Added ebook page to the Codex of Dust; and also to the rulebook page. Currently we have two ebooks, one of the rulebook, and one of the codex of dust content, .mobi (kindle) format. Added Urza don Crucible to the Guild Retreat from Petra's Hearth Historical Event. If there are any Historical Events or Ancient Tales which should be claimed, but have not yet been updated, or if you wish to claim a new one, please email dtd at rule of three dot net. Corrected the starting CP total. This new number reflects the 4 CP addition from the Eclipse Arc 1 closer. Added the Sense Nether Advantage. This Advantage may only be purchased after character creation, and requires in-play teaching and the investment of BGAs. Reduced the number of silver lumps required to silver Short Blunt and Long Blunt weapons. Revised the rules for the Breach Kit. Moved Choking Sands down to 4th circle Desert Screamer. circle Desert Screamer. Moved Decay up to 6th circle Desert Screamer. Changed Decay from a Knockdown effect to a Stun effect. Clarified rules on concentration during casting. Clarified rules around aiding stable characters who are not yet Walking Wounded. Added the Glue effect to the Effects list. Added the Knockback effect to the Effects list. Added the Leap effect to the Effects list. Altered the Weaken effect to no longer prevent a character from using the Counter Magic combat maneuver. Clarified that pierce illusion and sense lesser illusion defeat an Obscure, telling you that the target is under a lesser illusion. The ban on the research of new celestial spells has been lifted. 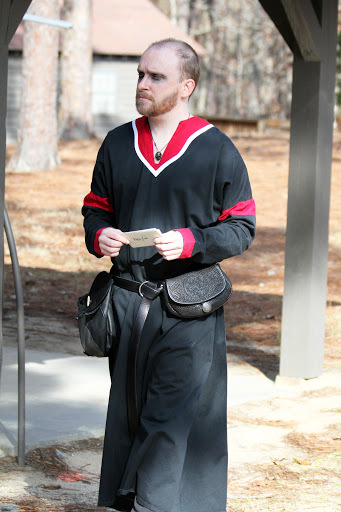 Added Atlanta LARP Project to the links page. Fixed current Patriarch on Redwood Throne page; it now correctly says Balduin III. Updated home page for next event. Updated next event information, and menu for March Feast on events page. Fixed bugs from various places around the site. Dead characters may remain with their bodies and interact with characters who have the Medium Advantage. Once they leave their bodies, they must acquire a Ghost Shroud or a green or yellow glow necklace for characters with the Medium Advantage to interact with them. The Displaced Hand ability Pinning Blow may now be used two (2) times at Intermediate Displaced Hand and three (3) times at Master. The Lost Blades ability Slice now notes that it may not be combined with other Wounding Blows or Maneuvers, and does not count against the limit of three maneuvers of one type per battle. The Sand Spire ability Skewer now notes that it does not count against the limit of three Wounding Blows per combat. Added rules for copying legal documents, and documents that have no game effects. Two references to a power “Blood Skull” have been corrected to Mysteries of the Ancestors. Removed speaking from the list of things prevented by the Befuddle effect. All forms should now be up to date. March and future pre-reg available also on the events page.